Emma and Georgina from our India and Arabia team recently returned from Oman where they experienced our brand new luxury bespoke camping. 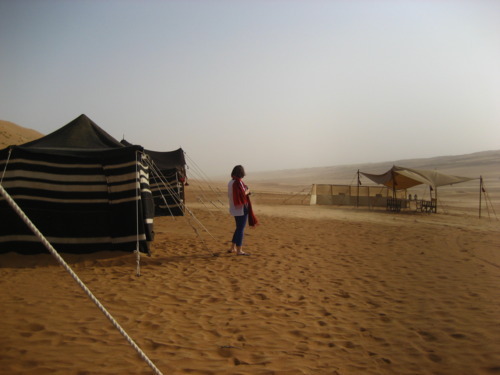 Here Emma shares the uniqueness of camping in Wahiba Sands, the solitude of the dunes and the surprisingly high level of comfort, service and style achieved in such a secluded but beautiful part of the world. Our tented camp deep in the dunes of Oman’s Wahiba Sands, was a complete highlight of our Middle Eastern trip and traveling to get there was an experience in itself. 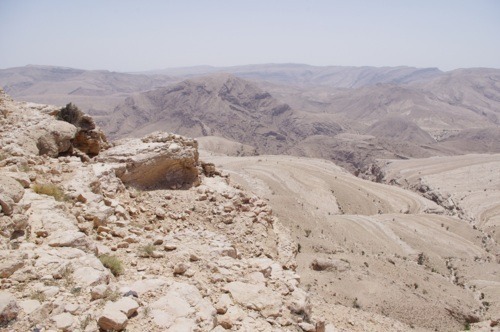 To arrive at Sharqiya (Eastern) Sands (more commonly referred to as Wahiba Sands) we opted for a scenic journey over the Eastern Hajar Mountains. Our journey took us on a near vertical ascent to the plateau of the mountain range and included some hair-raising, hairpin bends. Despite this, the drive was extremely worthwhile and we were able to glimpse remote villages and shepherd’s enclosures which until recently were inaccessible by car. 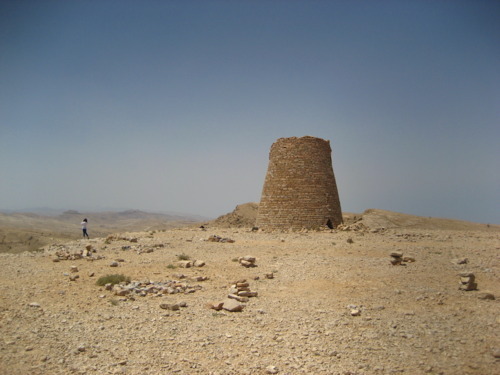 The panoramas of the arid, rugged stone mountains were unforgettable. On reaching the summit, it was time for lunch. Our team of dedicated staff had chosen a fantastically scenic location for us – an ancient tomb structure with an incredible outlook of the mountains below. Whilst we enjoyed the views, our chef got to work preparing us an impressive meze selection, which we enjoyed in the shade of the tomb before driving on past oases and small settlements to the dunes of the desert. We were delighted to receive a warm welcome at the camp and a much-needed cold drink before being shown the facilities of our authentic Bedouin tents. Not too authentic (fortunately) as I am definitely more of a glamper than a camper! 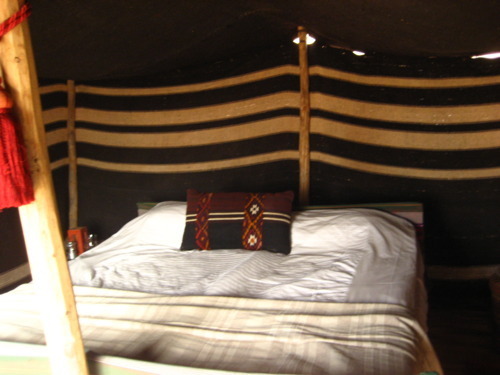 The tents are well equipped with crisp bed linen and comfortable mattress – and the tented bathrooms, a few steps for the bedroom were charming with your own shower, solar heated water, fluffy towels and toiletries. 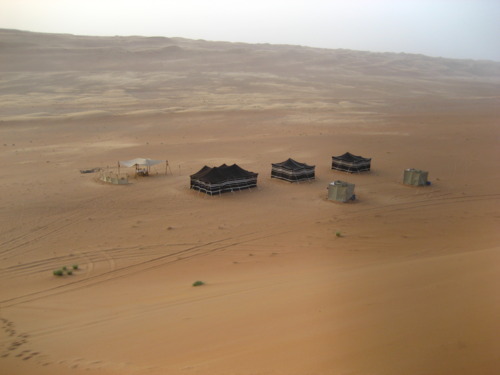 As the desert wind died down in time for sunset we climbed the dune behind our camp to look down on the tents below. 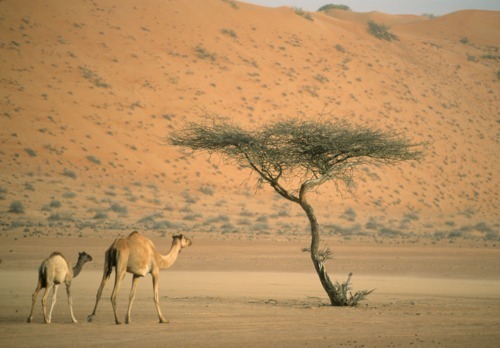 We could hear only the sounds of our chef preparing our supper and the only other sign of civilization was a tribesman tending his camels in the far distance. Georgina and I looked at each other and agreed that it would have been an exceptionally romantic moment had we been with our partners and not one another! 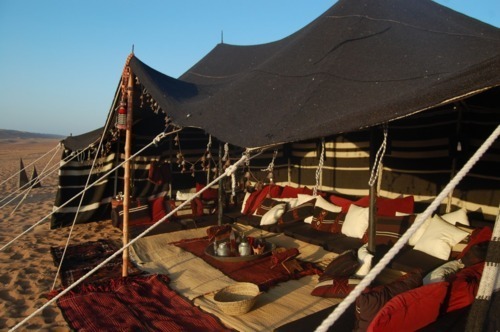 Still, not to be deterred from enjoying the experience to the max, we clambered down the dunes to enjoy a mint tea in the central “meeting tent” or Majlis the largest of the tents set up for the camp and one which is stylishly furnished with Arabic furniture, carpets and cushions. The tent had been illuminated with flickering candles in preparation for the sun’s disappearance for the day and again created another romantic atmosphere and perfect environment to totally wind down and relax. In the desert it gets very dark quickly and the stars were some of the clearest I have ever witnessed. A fire was lit and we went to sit nearby at our table under the stars. It was really quite remarkable the quality of food that came out of the small, tented kitchen, which was by no means elaborate having only a gas stove. We went to bed very satisfied by our delicious meal which was served to us by our attentive hosts. Indeed, being well fed combined with the peace and quiet of the surroundings provided an amazing night’s sleep. We were very sad to leave our camp the next day and would definitely recommend at least 2 nights of camping in an Oman itinerary combining the dunes of Wahiba with the beachside or mountains.